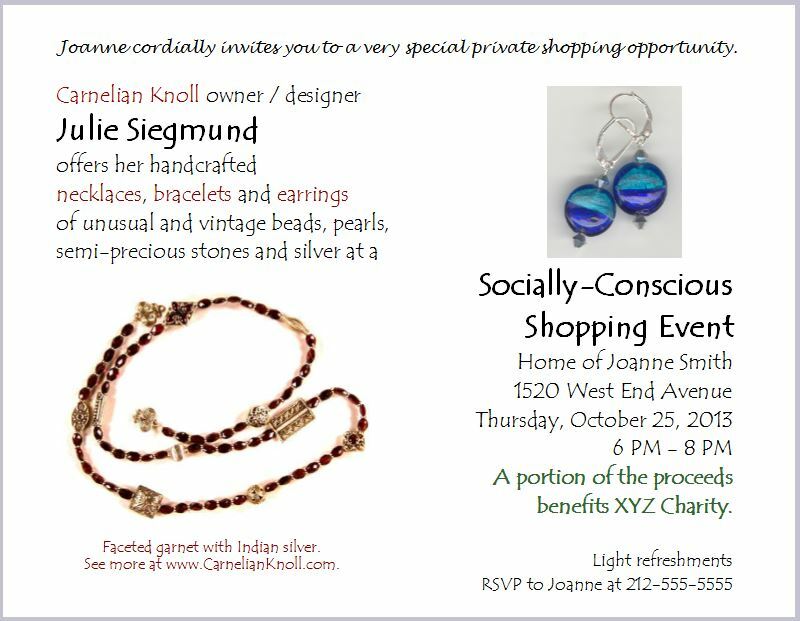 Carnelian Knoll’s “Socially-Conscious Shopping” events offer your guests a cozy, personalized purchasing experience while painlessly raising funds for your favorite charity. You gather 10 or more guests (including yourself) who are interested in purchasing Carnelian Knoll creations and invite them to your home or office. Carnelian Knoll will provide customized invitations (like the one below) and, of course, the jewelry. You provide the venue and snacks for the guests. Together we'll have a few hours of fun schmoozing and shopping. Sometimes clients even bring outfits that they are looking to accessorize. At the end of the show, Carnelian Knoll will give the charity of your choice $100 plus 15% of the sales over $1,000. So, a show that brings in, say, $1,500, will net your charity $175 (that's $100 plus 15% of $500); a show that brings in $3,000 will net $400 ($100 plus 15% of $2,000). And no host has ever escaped without a gift from Carnelian Knoll! Shows may be scheduled in the New York metropolitan area. (Let's talk if you'd like to host a show outside the New York metro area.) To schedule a show, contact Julie at juliesiegmund@carnelianknoll.com.